Prestashop One click (single click) checkout module adds a 'Buy Now' button on Product pages, clicking on which instantly takes the users to the checkout page with only the current product in the cart. Prestashop One click (single click) checkout module adds a new 'Buy Now' button on your Product pages, clicking on which will instantly take the customer to the checkout page with the current product only. Thus, saving them from countless “Continue” buttons in the path to reach the checkout page. This saves a lot of time for the customer and helps them do an impulsive buy without having to remove rest of the items from their cart which they intend to buy later. NOTE: This One-click (Single click) checkout module doesn’t modify your checkout page design. 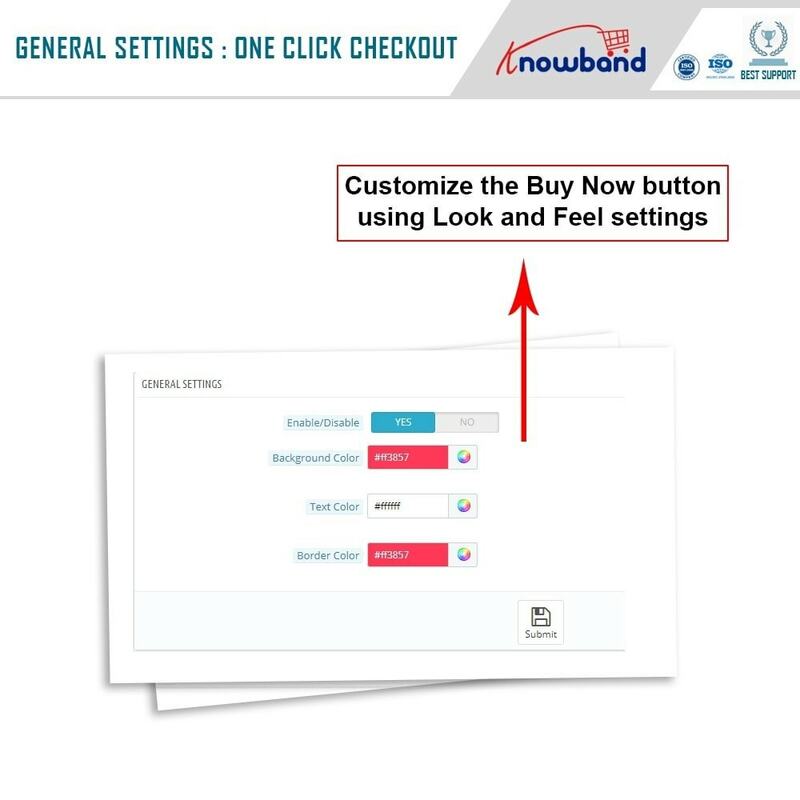 It adds a "Buy Now" button on the product pages that directly takes the customers to the checkout page with the existing product. So, please don’t get confused, it’s not a checkout module. 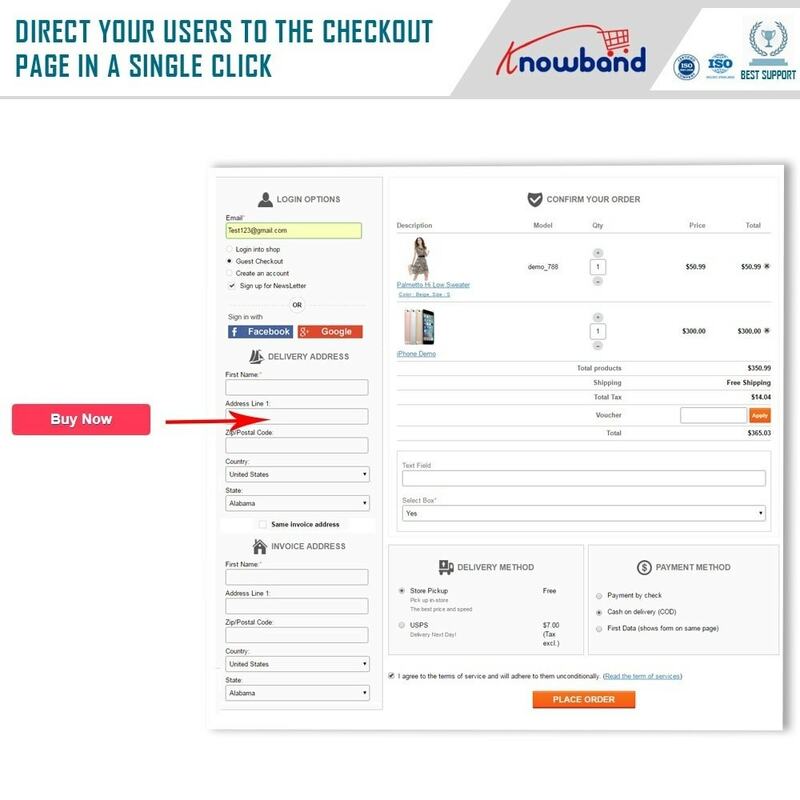 If you like our demo's checkout page design, please check our checkout module on below link. 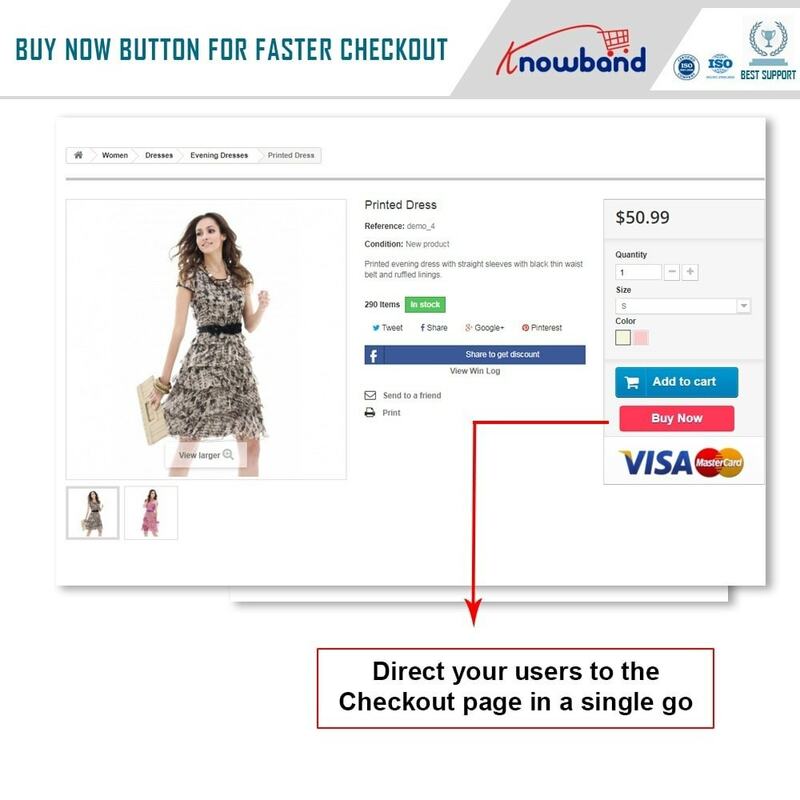 - This Fast checkout module helps to eliminate checkout funnel distractions found in the path of reaching the checkout page through the regular way. - Prestashop One-click (Single click) checkout helps you to focus on the conversion of individual products rather than all set of related and non-related products. Customize the “Buy Now” button as per your need. No coding required. Clicking on “Buy Now” will hold the current cart and check out with the single current product only. The regular shopping cart and products in it will remain untouched. 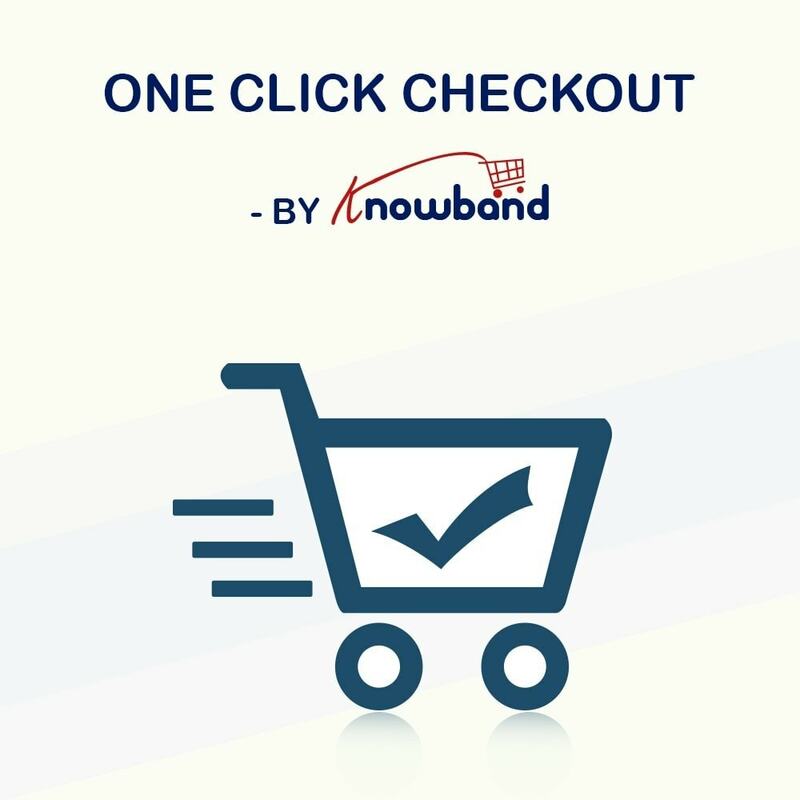 Prestashop One-click (Sigle click) checkout module can revert the previous cart and also add the current product to it, in case the quick order was not completed. Fully Customizable front look and feel. The fully responsive interface will provide this feature to your mobile users too. Prestashop One-click (Single click) checkout compatible with all the PrestaShop themes. Prestashop One-click (Single click) checkout does not conflict with any other third-party module. Customers with an intent to buy a single product only will like the quick buying experience. Customers visiting your site on their mobiles will get the same appealing UX on their mobile devices too. They will like the feature that restores the previous cart back after completing the current quick order. 1. You may also like our One-page checkout module, this addon offers faster checkout and increases conversion rates. 2. You may also like our Abandoned Cart Addon, this addon track the abandoned cart of your website and increase conversion rates.